The idea behind the TouchArcade Game of the Week is that every Friday afternoon we post the one game that came out this week that we think is worth giving a special nod to. Now, before anyone goes over-thinking this, it doesn’t necessarily mean our Game of the Week pick is the highest scoring game in a review, the game with the best graphics, or really any other quantifiable “best" thing. Instead, it’s more just us picking out the single game out of the week’s releases that we think is the most noteworthy, surprising, interesting, or really any other hard to describe quality that makes it worth having if you were just going to pick up one. These picks might be controversial, and that’s OK. If you disagree with what we’ve chosen, let’s try to use the comments of these articles to have conversations about what game is your game of the week and why. The best thing about mobile is how pretty much anyone can have a unique idea for a game and bring it to fruition in front of an audience of billions. I love getting high end traditional games on mobile too, but it’s these quirky little gems that always seem to please me the most. And when I say quirky little gem there is probably no better description than that for SphereKnight (Free) from a developer named Hiroaki Saito. SphereKnight takes the concept of an adventure RPG but replaces the action with a touchscreen-friendly swipe control system. Each level takes place on a single screen and you’ll swipe move your spherical knight (hence the title of the game) in any direction. Swipe again for a quicker dash move. The game is sort of an arena fighter where you’ll take down however enemies are required as shown by the counter in the upper right corner of the screen. Actually taking down enemies comes down to your level, and it’s a bit like the Hungry Shark games or the classic Feeding Frenzy. In the upper left corner of the screen it’ll show whichever enemies are in play as well as their level, and if you’re own level is high enough you simply roll into those enemies to defeat them. Roll into an enemy that’s too high of a level or into any enemies projectile attack and you’ll bounce back and lose a bit of life from your HP gauge. It’s a really simple concept but one that’s really fun in practice. Avoiding those higher level enemies while targeting the ones you can kill as well as trying to collect all the coins that defeated enemies drop is a wild ride. 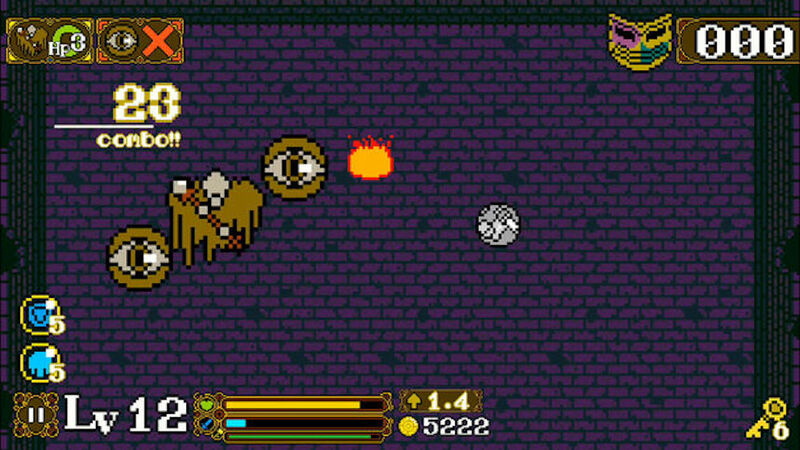 After you complete a certain number of levels you’ll encounter a boss fight, and if you take down the boss you’ll be kicked back to the title screen where you can spend your newly gotten riches on things like magical items and new weapons or armor. It’s a really neat game loop and one that I’ve been revisiting constantly all week. While SphereKnight is an iPhone only app (it should work on iPad but isn’t natively Universal), it’s totally free to download and try with ads thrown in the mix. If you don’t like ads, you can purchase an IAP that removes them for $2.99. This is just the sort of weird little game that got me super into iPhone gaming in the first place so if you appreciate the occasional “hidden gem" then I’d definitely give SphereKnight a try for free.